PARIS - Seven members of the Ground Self-Defense Force took part in the annual Bastille Day parade in Paris on Saturday. 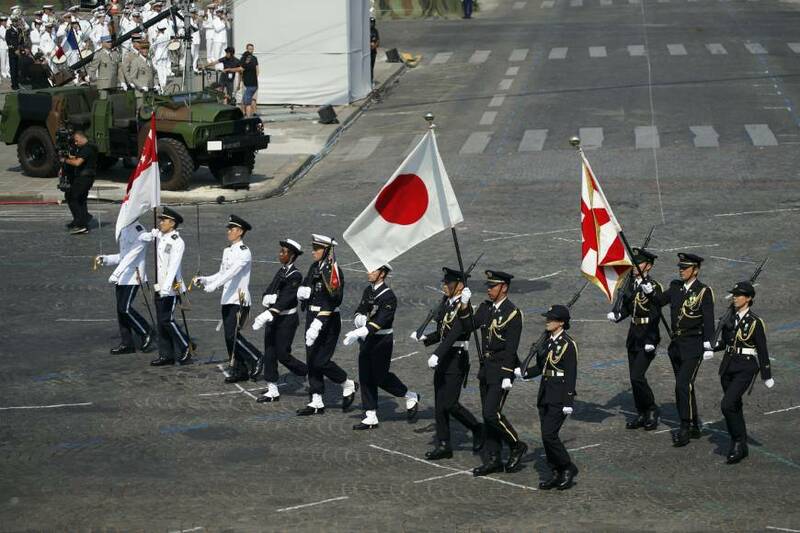 The seven, including Col. Hiroyuki Yokoyama, head of the 32nd Infantry Regiment of the GSDF’s 1st Division, were among some 4,300 participants who marched about 2.5 km from the Arc de Triomphe to the Place de la Concorde. Visiting Foreign Minister Taro Kono watched the parade. The French government invited the SDF to participate as this year marks the 160th anniversary of the conclusion of the Japan-France amity and commerce treaty, which established diplomatic relations between the two countries. 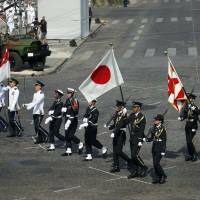 It was the third time for SDF personnel to participate in the annual parade. The first time was in 2008 and the second in 2014. Kono told reporters that the event opened a new chapter in bilateral cooperation. Every July 14, France marks the anniversary of the Storming of the Bastille in 1789, a key event in the French Revolution. Prime Minister Shinzo Abe was scheduled to watch this year’s parade but canceled his plan to tour Belgium, France, Saudi Arabia and Egypt in light of the deadly floods in western Japan. On Saturday, Japan and France agreed to establish a new framework for discussing maritime issues and strengthening coordination. Foreign Minister Taro Kono and his counterpart Jean-Yves Le Drian reached the agreement amid China’s growing influence at sea. The ministers confirmed they will work closely to ensure the rule of law in the Indo-Pacific region. France also places importance on maritime security in the Pacific Ocean, where it oversees New Caledonia. “Free and open seas are the foundation for the peace and prosperity of not only Japan and France but also the international community. We see potential for cooperation with France in many respects,” Kono told reporters. Kono and Le Drian also discussed North Korea and agreed on the importance of keeping U.N. sanctions in place to urge Pyongyang to dismantle all of its nuclear weapons and missiles in a complete, verifiable, and irreversible way, according to the ministry. Kono visited France on Abe’s behalf. On Friday, Japan and France signed an acquisition and cross-servicing agreement that allows the their armed forces to provide food, fuel, ammunition and other supplies to each other.